Thank you all for your nominations for the History Carnival. There remain many mounds of unearthed, little known, previously ignored and unusual history and this month’s carnival is dedicated to this hidden history and the peculiar past. Animals have very rarely featured in our news stories, but here are three posts devoted to animal history. 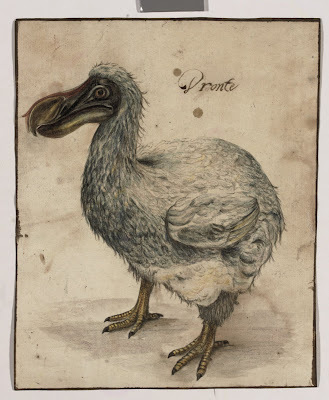 On July 9th, a previously unknown 17th-century Dutch portrait of a dodo, an animal that had become extinct by 1700 and has fascinated popular imagination ever since, was sold at Christie’s for £44,450 (the estimated sale price was between £5,000 and £7,000). Quoting a chapter on the impact of passions from Agrippa von Nettesheim’s Three Books of Occult Philosophy, ‘Passion and white peacocks’ considers the curious 17th-century belief that the passions, imagination and the environment of animals could affect their offspring. Lastly, images from Volume One of Albertus Seba’s Cabinet of Curiosities, published in 1734, have recently become available on the Botanicus website of the Missouri Botanical Gardens. The following two posts are devoted to little celebrated or forgotten anniversaries. On July 6th 1885, Louis Pasteur administered the first shots of a vaccine against rabies that had never been tested on humans before. On July 2nd 1706, Kimpa Vita, a Congolese noblewoman who claimed to be a spirit of Saint Anthony of Padua was burned as a witch in Evululu. Who was Kimpa Vita and what was the situation in the Kingdom of Kongo at the time? These three posts explore little-studied and previously unknown areas of history in Europe, the United States and Asia. During the Second World War, it is estimated that there were 12,250,000 non-battle deaths in the USSR. This figure is by far the highest of any nation attacked by Nazi Germany in the period between 1933 and 1945. ‘Nazi body count in the USSR’ seeks to explain how this devastation came about. The prehistoric era in North America is another rarely studied period of history. Yet, in the state of Ohio there exist a series of earthen mounds which are remnants of prehistoric walls. But in Alabama permission has recently been given to Walmart to level one of the mounds in order to build a new supermarket. ‘Curating the Oceans’ provides a description of the treasures dated to the Chinese Tang dynasty that were recovered, in 1998, from the Belitung shipwreck in the Gaspar Strait in Indonesia. Lastly, there remain a significant number of unpublished, understudied and relatively ignored historical sources. In 1935, Peter Fleming travelled from Beijing to India to report back to The Times on what was happening in the remote territory of Xinjiang, or Chinese Turkestan. His reports are published on The Times Archive Blog. On the Soldier’s Mail blog, 91 years after the events, we follow the daily life of Samuel Edward Avery in France during the First World War through his letters and diary notes. Finally, can the Ladybird book Oliver Cromwell: An Adventure of History teach us anything about the English Civil War?